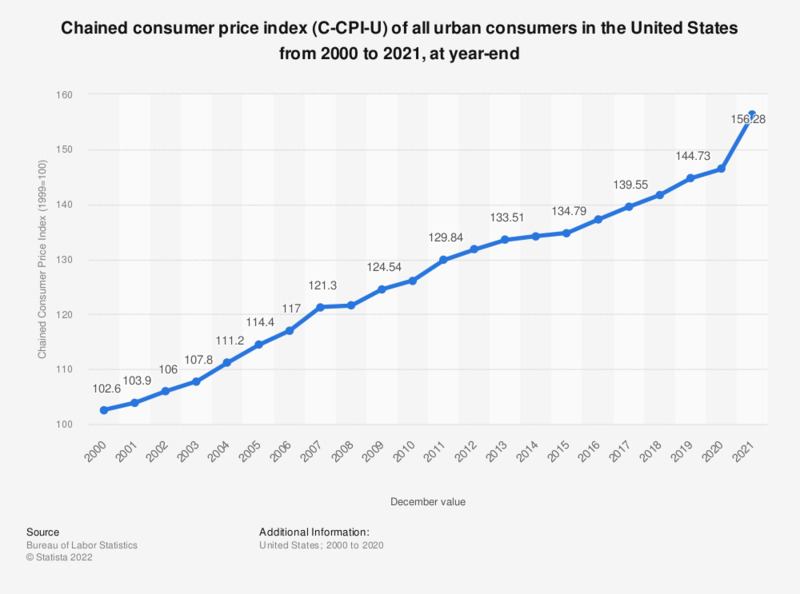 This statistic shows the unadjusted chained Consumer Price Index in the United States from 2000 to 2018 at year-end. In December 2018, the chained consumer price index stood at 141.92, reflecting 41.92 percent increase from the base year 1999. The average wages garnered in select countries around the world based on purchasing power can be accessed here. The data represents U.S. city averages. The base period was December 1999=100. The chain weighted CPI incorporates the average changes in the quantity of goods purchased, along with standard pricing effects. This allows the chain weighted CPI to reflect situations where customers shift the weight of their purchases from one area of spending to another. The Bureau of Labor statistics no longer publishes annual averages for the chained CPI. For annual comparisons, data from December of the respective year is used.